Water is one of our most precious resources. So it's important to save as much as possible. Two-thirds of the Earth's surface is covered in water but only less than one-half of one percent of that water is currently available for our use. The world's population is over 7 billion, water costs are increasing and service rates are growing rapidly. Some ways to better manage water are to value it more, use it sustainably with appropriate technology and ensure equitable access to water. The average American lifestyle uses about 2,000 gallons of water a day – twice the global average. Do you know what is your water footprint? Here are some Water Footprint Calculators to help you learn about your water use and how to better manage it. Take a water tour with National Geographic through your home, yard, diet, energy, and consumer choices! Then, pledge to cut your water footprint and help return more water to rivers, lakes, wetlands, underground aquifers, and freshwater species. 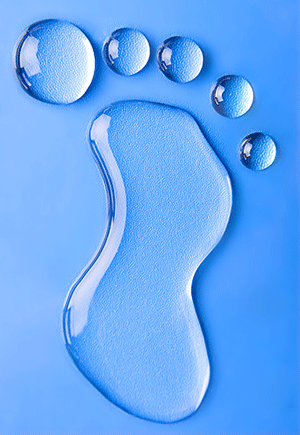 Use Water Footprint Network's extended water footprint calculator to assess your own unique water footprint.Your individual water footprint is equal to the water required to produce the goods and services consumed by you. The calculations are based on the water requirements per unit of product as in your country of residence.